Lincoln Heights Veterinary Clinic has always been committed to providing the highest level of care and compassion. As soon as we heard about Fear Free we knew this was something we needed to pursue. All of our employees are certified or in the process of getting certified and as of June 19th we have applied for Fear Free clinic certification. From the Fear Free practice certification website: The Fear Free Certification Program provides professionals with the tools, protocols and knowledge to reduce fear, anxiety and stress in patients, and to implement Fear Free into their practices. Practice Certification takes Fear Free to the next level – from an individual to a joint effort that requires the entire practice team to work together to achieve certification. 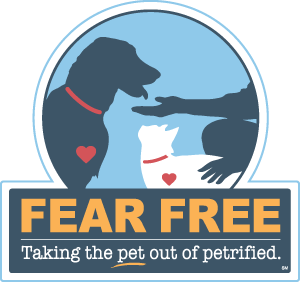 Fear Free Certified Practices will represent the pinnacle of care in the industry and will be highly sought after by pet owners who are realizing the importance of emotional wellness for their pets. -Leaving carriers out in the house for days or weeks prior to the visit for our feline friends to get comfortable in them. -Picking up a comfort kit from the clinic prior to the visit. -Using Feliway (purchased from clinic or online) in carrier and on blanket for the trip to the clinic. -Making sure that carrier is covered and placed on the floor behind the passengers seat in the car. -Stop by any time for a 'treat' visit. We love to see our patients and lots of treats to share. -Make sure collar is comfortable. -Pick up a comfort kit prior to visit. -Wait outside or in the car while you wait to be seen by the doctor. Comfort Kits include Composure Chews for your dog or Composure Chews and a Feliway wipe for your cat. These pheromones are designed to mimic the smells associated with home and the safety your home provides. They help your pet feel like they are in a familiar place because the smell of the pheromone mimics the “safe” smell of your pet’s natural environment. The effect is amazing! Once you arrive at the clinic we have options for where you and your pet wait. You can wait in our grassy area or in the car and our technician will come get you when it is time to see the doctor. We also provide bandanas for dogs and towels to cover the cat carriers which have pheromones sprayed on them when you arrive. For our feline friends, we ask that when you arrive you allow us to put you and your cat directly into an exam room to wait. This separates your calm cat from the potentially noisy dogs in the lobby, further decreasing their stress response. When you first enter the exam room, you will notice soft, classical music playing. This album is called “Through a Dog’s/Cat's Ear.” and has been clinically proven to decrease stress in dogs and cats. There is also a pheremone difusser plugged in, non-slip mats on the table, and lots of treats to come your pets way. PLEASE ALERT US OF ANY ALLEGIES IN THE HOME!! Food is a major motivator for both cats and dogs and our tasty treats can hardly be resisted! We ask that you bring your pet in on an empty stomach as our treats will be more readily received and the act of taking food from a stranger decreases the fear response your pet may have and fosters a feeling of trust between your pet and our staff. Behold! Food! Encouraging friendships between your pet and our caring doctors and assistants! We will try to ensure your pet receives a steady supply of treats throughout the exam and vaccination process, many times while your pet is distracted with food, they won’t even notice the vaccination itself or the blood draw for the blood test. **Our journey to a “fear-free” clinic is constantly evolving, please let us know any other ideas you may have to keep your pets stress to a minimum. For helpful articles to get your pet to the vet please click on the link below.